I’m sure you can tell from your in-box that one of the latest tricks marketing pitchmen are convincing business owners to use is the “faux personal” email. As more and more people see the online marketing pitchmen for what they really are, the wolves are attempting to hide by putting on sheep’s clothing. Of course, you did not talk to Fred last week. This is just a ploy to get past your spam filters and trick you into looking at Fred’s sales materials. And one of the most irritating ways these types of pitchmen try to get around your spam filter is by not including any sort of opt-out or unsubscribe option. Those unsubscribe links are indications to spam filters that the message is a mass email from someone you probably don’t know. Omitting them gets the message through your filters and makes it seem more personal when you open it (because your actual friends don’t include opt-out links in their emails either, right?). The question, naturally, is whether all these new gimmicks actually work. Do people really respond to these sleazy messages? The other night on the way home from work, I saw one of those “faux personal” messages in my email on my phone while I was sitting at a red light. There was a note from the CEO and an invitation to reach out, so I dialed the number. My plan was to ask him if the campaign was working for him, but I knew the answer with the first word out of his mouth. 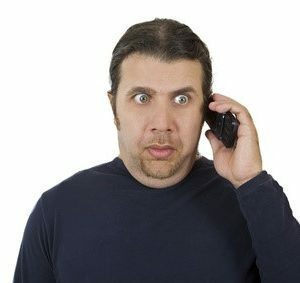 It was apparent that the CEO who’d sent out the emails asking people to connect with him was caught off guard when his phone actually rang. So I had my answer. Obviously, no one was calling as a result of his campaign. I paused, but there was just stunned silence on Fred’s end. “Oh, yeah!” Fred interjected, realizing what was going on. Fred was very cordial and explained that he’d purchased the email program from a marketing firm that claimed to have expertise in his industry. We went on to have a nice conversation about his business and what he was trying to accomplish. It became apparent to me that Fred himself was a good guy who had just been duped by online marketing pitchmen. In the end, Fred and I had a nice chat and he may even become a client of ours at Civilis Marketing. In that way, he can initiate and nurture relationships with potential customers in an authentic way—a way that will result in him getting calls and knowing who the people are when they contact him. Even if you get your message past the spam filters of your prospects, real humans can still tell you are trying to deceive them. If your phone, like Fred’s, is not ringing, this is reliable proof that people see through those gimmicks and tricks you are trying to use on them. Whether you get help from us or not, you should at least give serious consideration to stopping deceptive campaigns like Fred’s before you ruin your relationship and reputation with the hundreds (or thousands) of business owners the marketing pitchmen have convinced you to spam.